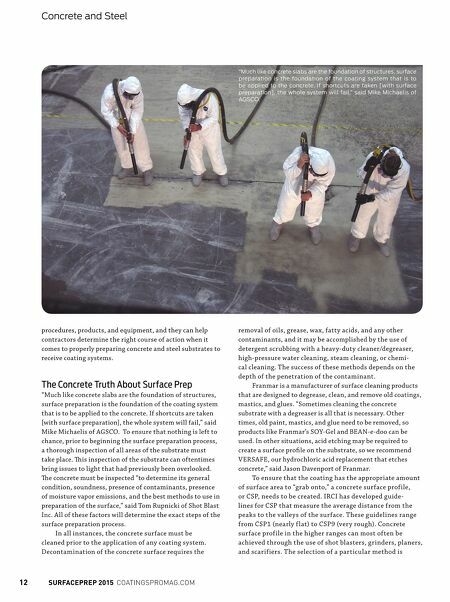 12 SURFACEPREP 2015 COATINGSPROMAG.COM Concrete and Steel procedures, products, and equipment, and they can help contractors determine the right course of action when it comes to properly preparing concrete and steel substrates to receive coating systems. The Concrete Truth About Surface Prep "Much like concrete slabs are the foundation of structures, surface preparation is the foundation of the coating system that is to be applied to the concrete. If shortcuts are taken [with surface preparation], the whole system will fail," said Mike Michaelis of AGSCO. To ensure that nothing is left to chance, prior to beginning the surface preparation process, a thorough inspection of all areas of the substrate must take place. Tis inspection of the substrate can oftentimes bring issues to light that had previously been overlooked. Te concrete must be inspected "to determine its general condition, soundness, presence of contaminants, presence of moisture vapor emissions, and the best methods to use in preparation of the surface," said Tom Rupnicki of Shot Blast Inc. A ll of these factors will determine the exact steps of the surface preparation process. In all instances, the concrete surface must be cleaned prior to the application of any coating system. Decontamination of the concrete surface requires the removal of oils, grease, wa x, fatty acids, and any other contaminants, and it may be accomplished by the use of detergent scrubbing w ith a heav y-duty cleaner/degreaser, high-pressure water cleaning, steam cleaning, or chemi- cal cleaning. T he success of these methods depends on the depth of the penetration of the contaminant. Franmar is a manufacturer of surface cleaning products that are designed to degrease, clean, and remove old coatings, mastics, and glues. "Sometimes cleaning the concrete substrate with a degreaser is all that is necessary. Other times, old paint, mastics, and glue need to be removed, so products like Franmar's SOY-Gel and BEAN-e-doo can be used. 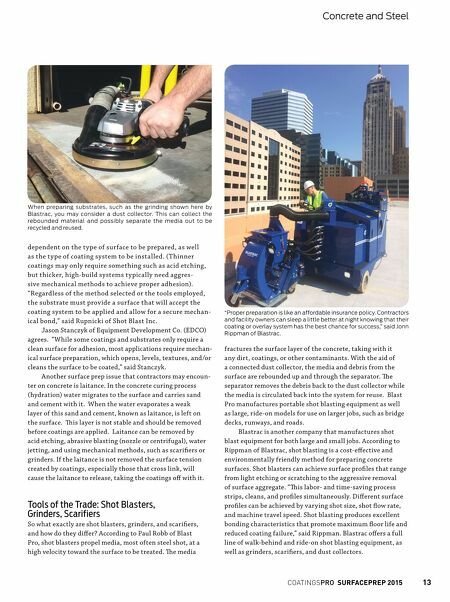 In other situations, acid etching may be required to create a surface profle on the substrate, so we recommend VERSAFE, our hydrochloric acid replacement that etches concrete," said Jason Davenport of Franmar. To ensure that the coating has the appropr iate amount of sur face area to "grab onto," a concrete sur face profile, or CSP, needs to be created. IRCI has developed g uide- lines for CSP that measure the average distance from the peaks to the va lleys of the sur face. T hese g uidelines range from CSP1 (nearly f lat) to CSP9 (ver y rough). Concrete sur face profile in the higher ranges can most often be achieved through the use of shot blasters, gr inders, planers, and scar ifiers. T he selection of a particular method is "Much like concrete slabs are the foundation of structures, surface preparation is the foundation of the coating system that is to be applied to the concrete. If shortcuts are taken [with surface preparation], the whole system will fail," said Mike Michaelis of AGSCO.